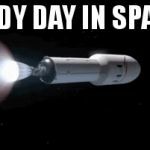 the case is going at the same speed of the rocket when it was jettisoned, but the rocket continues to accelerate after that, so thats why the case appears to slow down as if there was wind, if thats what your talking about. The third law is every reaction has an equal and opposite reaction. How does this violate it? This is flattard idiocy. First, there is thin but existant gas in the very upper atmosphere, which at high enough speeds can provide a decelerant. Two, even were there none, the shells ejecting would still not be blown back, they would be just left behind, outpaced by the still accelerating craft - see the burning engine moving the core craft still faster? And where was the front mounted camera during all your conjectured nonsense. And you’re wrong there spherf: SCIENTISM was never our strong suit. Science and physics always proves we live on a stationary motionless #planate. Description of the workings of the predictable laws of physics is not conjecture. But thanks for helping me better understand how your head does (not) work, it helps in a way. And your bevy of evidence that the predictable laws of physics were observed? Show us the fairing doors blasted away (as you claim they did) with the #videoevidence from ANY of the following camera angles: 1. The Side Shot Camera 2. The Hood Shot Camera 3. The Nozzle Shot Camera 4. The Driver’s Seat Camera 5. The “Over The Shoulder” Camera mounted onto #StarMan or 6. The Second Stage Camera. Surely at least ONE of those was able to preserve, in digital video format, the “proof” of #ConservationOfMomentum you claim happens. 1. The graphic depicted an effect. 2. You claimed the effect was impossible. 3. I gave you TWO explanations why it was. 4. You didn't get it. 5. You started dancing around in every other direction without grasping THAT you didn't get it. Surprised it doesn't go any further? 3. Explanations don’t define reality, they describe it...but keep trying pal. Not surprised that you have ZERO evidence to the contrary???? I'm going to reply to myself, since I get an Invalid parent_id error when I reply directly to you. 1. 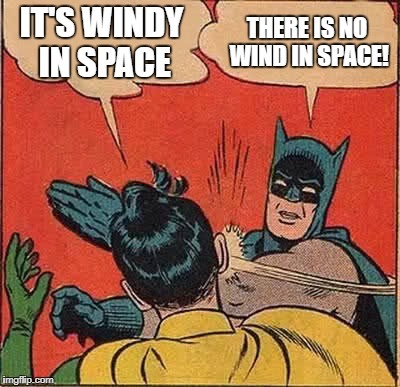 No, your exact question in the title was, "Windy Day In Space? What happened to conservation of momentum, Newton’s third law"
2. Your claim was that the effect depicted in the graphic was impossible because the shell pieces appeared to be swept back by a nonexistent aerial resistance in space. 3. My explanations didn't need to "define" reality, they simply needed to work as to how the effect described in your graphic were possible. 4. It's a computer modeling, not evidence. But it disproved your claim that with a conserved momentum (or actually an increasing one under the second explanation) the graphic depiction was impossible. 5. I've just proven I got it much better than you did. You failed to get how both those explanations worked to disprove your impossibility claim. However, it's possible - if not probable - than *you* will still not get it. 6. Repeating point 3, I didn't provide evidence, I provided two solid explanations, which *are* consistent with the evidenced laws of physics, that voided your objection. It therefore fails. If you can't follow that, as the thread suggests, I might as well explain thermodynamics to a fish. Sorry. Aaaaand...the reason for the error was you deleted your original comment and substituted an edited version, which is why the #6. If the craft is accelerating, it will move past the shells. It's not that they're being swept back, they just get left behind. It ain't - ummmm - rocket science. Your claim actually has been disproved. Isn’t editing wonderful? You can add additional clarity about thoughts or talking points by simply editing...ahhhh. If the craft is accelerating, it will be moving at the same speed as the shells at the time of their separation. There is supposedly NOTHING slowing them down, thus maintaining Netwon’s third law of the conservation of momentum. The craft’s velocity only slightly increased its speed from 10,100km/h to 10,200km/h as the shells blasted off. The shells, moving some 10,100km/h SHOULD appear in at least ONE of the mounted cameras as they break away from the fuselage, either front facing, side facing, rear facing or cockpit should have captured #VisualEvidence of such. How come space is fake? Ya can't argue with somebody who doesn't get the question.